T-Mobile is expected to add a new smartphone to its product portfolio this month, the Samsung Galaxy J7 (2016). 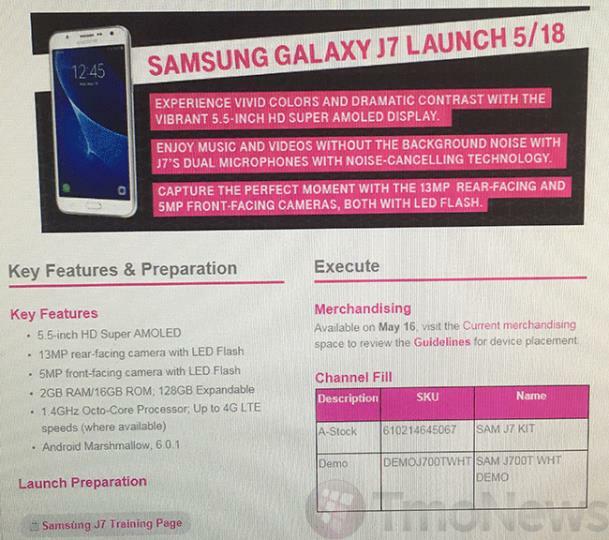 According to a leaked document obtained by the folks at TmoNews, the Magenta carrier is expected to announced the Samsung Galaxy J7 (2016) and LG K10 on May 18th. There’s no official word from the company about the launch so we’ll advise our readers to take it with a pinch of salt. May 18th is just around the corner and we’ll find out how much truth lies in this. As for specifications, Samsung Galaxy J7 (2016) comes with a 5.5-inch 720p display along with an octa-core Exynos processor clocked at 1.4GHz. The handset features 2GB of RAM, 16GB of internal storage, a microSD card slot, a 13MP camera for photos and videos, a 5MP front-facing camera, a 3,300 mAh battery and ships with Android 6.0.1 Marshmallow. As for the LG K10, it also brings a decent set of specifications on board, including a 5.3-inch HD display, 16GB of storage, a 2,200 mAh battery, 8MP main camera for photos and videos as well as a 5MP front-facing camera. We’ll update you as soon as T-Mobile launches these handsets.